Justin Edward Langille, III, was born in Kalamazoo, Michigan, on February 4, 1923, son of Justin E. and Mary (Brenner) Langille. From September 1938 to June 1942, he was an Army Reserve Officer Training Corps Cadet while attending Columbia (Tennessee) Military Academy and The Citadel, Charleston, South Carolina. He entered the U. S. Naval Academy, Annapolis, Maryland, on appointment from the State of Florida in 1942. As a midshipman, he was Sailing Master of the schooner FREEDOM (IX 43). Graduated and commissioned Ensign on June 6, 1945 with the Class of 1945, he subsequently advanced in rank to that of Rear Admiral on May 1, 1973. Following graduation from the Naval Academy in 1945, he joined the USS MOBILE (CL-63). He served in that cruiser in the Philippine Islands and Okinawa areas during the final days of World War II and participated in the evacuation of Allied prisoners from Nagasaki and in the initial occupation of Japan. In May 1946 he transferred to the USS OAKLAND (CLAA-95) and in November 1947 was detached for flight training at the Naval Air Station, Pensacola, Florida. Designated Naval Aviator on March 18, 1949, he had further training at the Fleet Airborne Electronics Training Unit, U. S. Atlantic Fleet until May 1949 and the next month joined Patrol Squadron FORTY. In February 1950 he reported as a Plane Commander with Air Transport Squadron THREE and in that assignment flew with the U. S. Air Force during the Trans-Pacific Korean Air Lift. He attended the Command Communications course at the Naval Postgraduate School, Monterey, California, from July 1952 to June 1953, after which he served as an Ordnance and Gunnery Instructor at the U. S. Naval Academy. In June 1954 he joined the USS MISSOURI (BB-63) and served as a Gunnery Instructor during the Midshipman's summer cruise. In August of that year he was detached for duty as Operations Officer of the USS WALKER (DDE-517). From November 1956 to May 1958 he was assigned to the Naval Communications Station, Kamiseya, Japan. He next had instruction in management and industrial engineering at Rensselaer Polytechnic Institute, Troy, New York, from which he received the degree of Master of Science in June 1959. Following service afloat as Gunnery Officer of the USS HELENA (CA-75), he reported in July 1961 for instruction at the Armed Forces Staff College, Norfolk, Virginia. He was Military Advisor to the Chief of the Navy Management Office., Executive Office of the Secretary of the Navy, Navy Department, Washington, D. C., for two years, February 1962 to February 1964 and the next month became Special Assistant to the Under Secretary of the Navy. In July 1964 he assumed command of the USS RICHARD B. ANDERSON (DD-786) and in January 1966 was detached to command Destroyer Division TWO HUNDRED THIRTEEN. He was awarded the Bronze Star Medal with Combat "V " and cited in part as follows: "...Captain Langille led his assigned forces with consummate skill through a series of naval gunfire and related support operations which contributed immeasurable to the success of both United States and South Vietnamese operations ashore.."
In April 1967 he reported as Chief of Staff and Aide to Commander Cruiser Destroyer Flotilla SEVEN. "For meritorious service in ... conflict with an opposing foreign force while serving as Chief of Staff and Aide to Commander Cruiser Destroyer Flotilla SEVEN, Commander Cruiser Destroyer Group SEVENTH Fleet (CTG 70-8), Commander Attack Carrier Striking Force SEVENTH Fleet Surface Action Group (CTG 77.1) and Surface Action Commander (CTU 77.1-0) embarked in USS ST. PAUL (CA-73) from May 1 to October 8., 1968..." he was awarded a Gold Star in lieu of the Second Bronze Star Medal with Combat "V". He is also entitled to the Ribbon for, and a facsimile of the Navy Unit Commendation awarded Cruiser-Destroyer Flotilla SEVEN. He became Deputy Director of Navy Laboratories in the Office of the Assistant Secretary of the Navy (Research and Development) and Deputy Director of Laboratory Programs, Naval Material Command, Washington, D. C.., in January 1969 and from March of that year until February 1970 had additional duty as Director of the Laboratory Management Division, Naval Material Command. He was awarded the Meritorious Service Medal and cited in part as follows: "...As a result of his expert planning, scheduling and directing, the consolidation and realignment of the major Navy Laboratories have been accomplished , with optimum benefits..." He remained there until August 1971, then was in command of Destroyer Squadron TWENTY ONE with additional duty as Commander Destroyer Division TWO HUNDRED ELEVEN until May 1972. 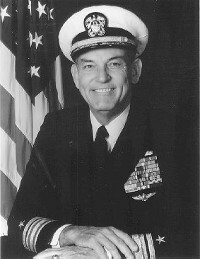 After temporary duty with Cruiser Destroyer Force, U. S. Pacific Fleet., he reported in June as Deputy Director for National Military Command Systems Technical Support, Defense Communications Agency, Washington, D. C. In July of 1979, Admiral Langille became the Commandant of the ELEVENTH NAVAL DISTRICT. In addition to the Bronze Star Medal with Gold Star and Combat "V the Meritorious Service Medal and the Navy Unit Commendation Ribbon., Rear Admiral Langille has the Combat Action Ribbon; China Service Medal; American Campaign Medal; Asiatic-Pacific Campaign Medal; World War II Victory Medal; Navy Occupation Service Medal, Asia Clasp; National Defense Service Medal with bronze star; Vietnam Service Medal and the Philippine Liberation Ribbon. He also has the Navy Distinguished Service Order Second Class awarded him by the Republic of Vietnam and the Republic of Vietnam Campaign Medal with Device. Admiral Langille retired from the Navy in 1981 and in October of 1982 became Director of the Scripps Institute of Oceanography. Rear Admiral Justin E. Langille III, U.S. Navy (retired) became Deputy Director of Scripps Institution of Oceanography on October 1, 1982. During his 36 year Navy career, Langille served in a variety of sea commands and high level research management positions in naval laboratories, programs and agencies. Langille attended the U.S. Naval Academy at Annapolis, Maryland, where he received his B.S. degree in naval science and electrical engineering in 1945, and was commissioned as an Ensign in the U.S. Navy. He attended the U.S. Naval post graduate school in 1952-53, and received his Master of Science degree in management engineering and industrial engineering from Rensselaer Polytechnic Institute, Troy, New York, in 1959. He also earned a B.S. degree in oceanography and ocean engineering from the U.S. Department of Agriculture Graduate School in Washington, D.C., in 1970. Langille’s military service included WWII, Korea, and Vietnam. He has held five surface ship commands and is also a qualified as a naval aviator. As a flag officer, he commanded a cruiser-destroyer group of 38 ships and commanded five carrier battle groups in conventional and nuclear carriers. He commanded the first and only visit of U.S. warships to the Soviet Union since WWII. During 1978-81, Langille was the Commandant of the Eleventh Naval District and Commander of Naval Bases, San Diego and San Francisco, serving as the senior defense representative in the six southwestern states for civilian groups, education, industry, and business officials. He has represented the Navy and the Department of Defense on numerous scientific commissions and task forces involving ocean research, including an assignment as a special assistant to the Secretary of the Navy on an office of Naval Research task force to reorganize Navy research and development in the early 1960’s. As a research manager for the Navy, Langille directed a communications and electronics research laboratory in Japan during 1956-58, and later served as the Deputy Director of Naval Laboratories during 1968-71. As Deputy Director of the Defense Communications Agency (1972-74) and Assistant Deputy Chief of Naval Operations for Surface Warfare (1976078) he had frequent involvement with members of the academic, government, and private research communities. Langille is the co-inventor of an underwater work vehicle and an aircraft escape device and the inventor of a shipboard helicopter landing computer. He is the author or co-author of numerous professional papers and technical publications, including several U.S. Naval Academy text books, on such topics as naval science, guided missiles, and underwater weapons. He was an academic faculty member of the U.S. Naval Academy, a member of Sigma Xi, the Royal Institution of Naval Architects, the Marine Technology Society, the U.S. Naval Institute and several other professional organizations. After his retirement from the Navy in 1981, Langille was employed as a marine consultant. He served as Director of Marine Operations with the Hubbs-Sea World research Institute. In addition, he conducted a study of marine facilities research vessels for Scripps Institution. Admiral Langille died on May 2, 1996 and was buried at sea, which is fitting for such a fine and distinguished career.